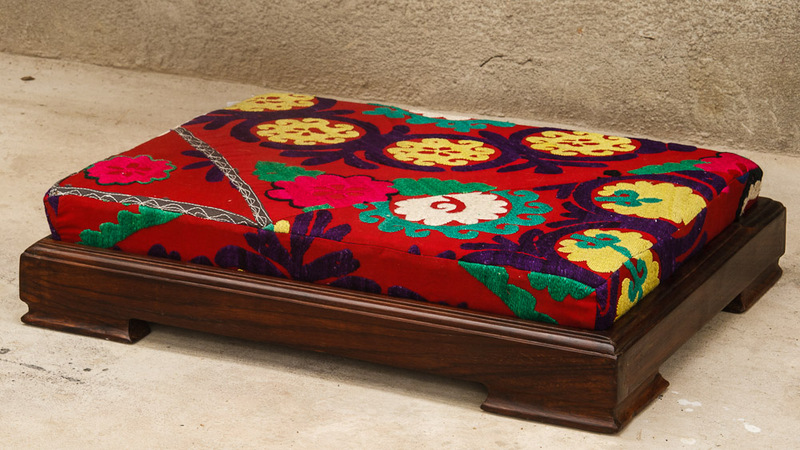 After the great welcome we received in Mumbai earlier this year, we are back with a new treasure chest of handpicked décor items from Central Asia. We will be exhibiting at ARTISANS’, Kala Ghoda from 20th to 22nd September between 11 am and 7 pm. 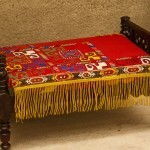 Highlights include vintage carpets from East Turkestan (now the Xinjiang Uyghur Region of China) and Tibet, thangkas and jewellery from Nepal, miniatures and ikat from Uzbekistan and limited edition furniture incorporating striking Central Asian fabrics created especially for us by designer Pragati Toshniwal. 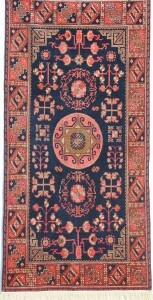 Rugs from the oasis city of Khotan (now Hotan) are particular favourites of Nishas. Khotan lies on a branch of the Silk Route that headed south from Kashgar to skirt the Taklamakan Desert. 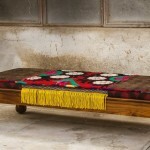 This remote region of western China, ringed by mountains and desert, vaunts a millennial tradition of tribal carpet weaving. 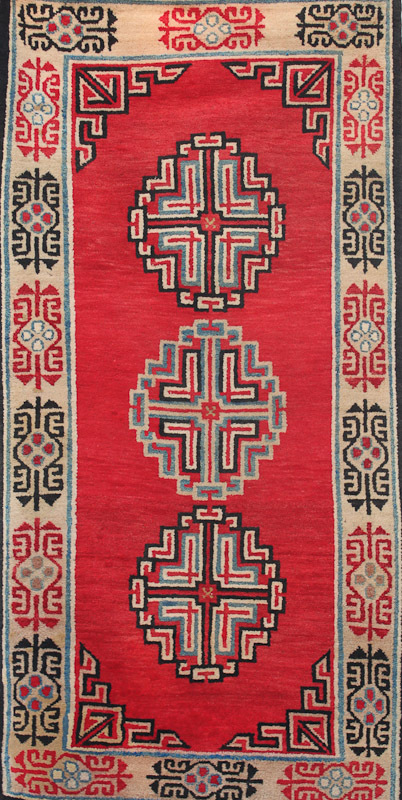 Wool-on-cotton Khotan rugs are characterised by a blend of Persian and Chinese motifs, a testament to this crossroads of civilizations and to the Buddhist and shamanistic past of this frontier. 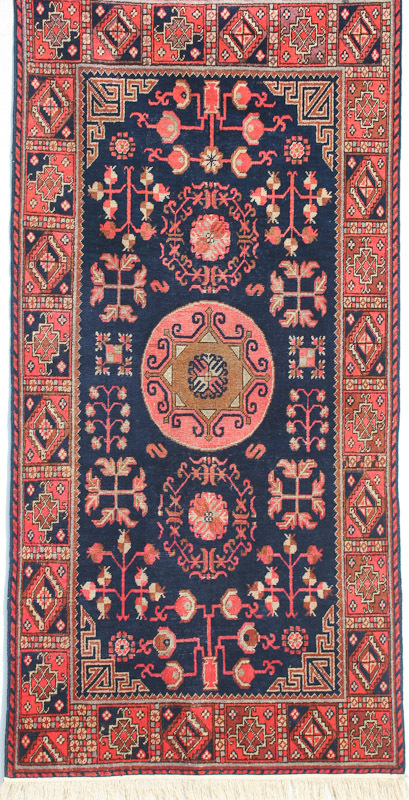 Thus the patterns most often used in Khotan rugs include the repetitive geometries of Islamic art, but also triple-medallion schemes in blue on red, pomegranate trees that grow from stylised vases, and coffered designs with chrysanthemum heads locked into squares. Also on show will be a number of Tibetan carpets with their unique knotting technique resulting in a thick and dense weave with heavy, lustrous pile. 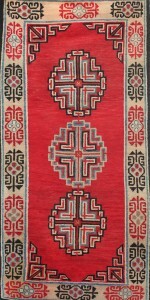 Made from highland sheep’s wool by Tibetan communities in Nepal and India, these rugs often exhibit simple geometric motifs, like the checkerboard and the amulet (gau) that formed part of a traditional Tibetan motif repertoire, mingled with medallion designs and other motifs borrowed from Chinese decorative arts. 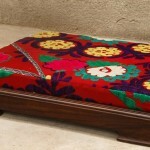 Such designs are well-suited to contemporary interior design. Some rarer examples are highly valued as collectibles because they bear striking, lively designs that feature rampant dragons or tigers inspired by tantric meditation. 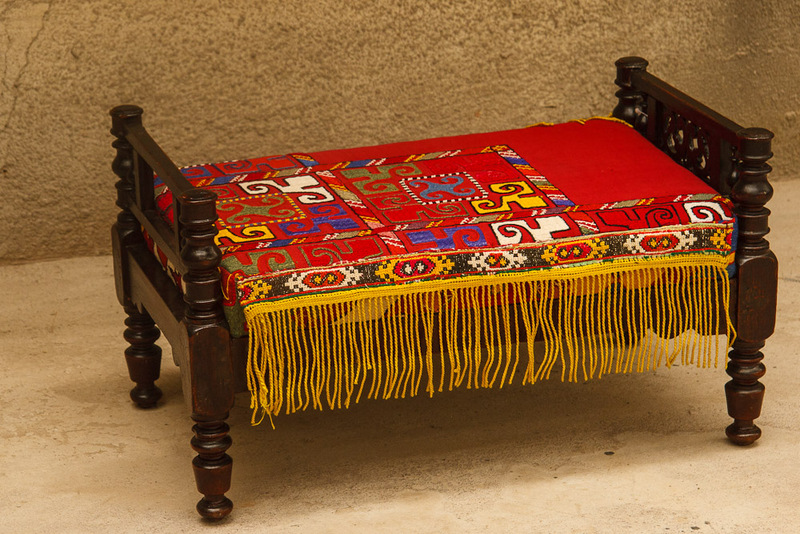 Lots of fascinating textiles acquired by Nisha on her travels have had the magical touch of Pragati Toshniwal and we are delighted to be showcasing our limited edition collection of furniture, a few pieces of which are shown below. For more information on this exhibition please see our Facebook event, and it would be great if you let us know if you’re coming! 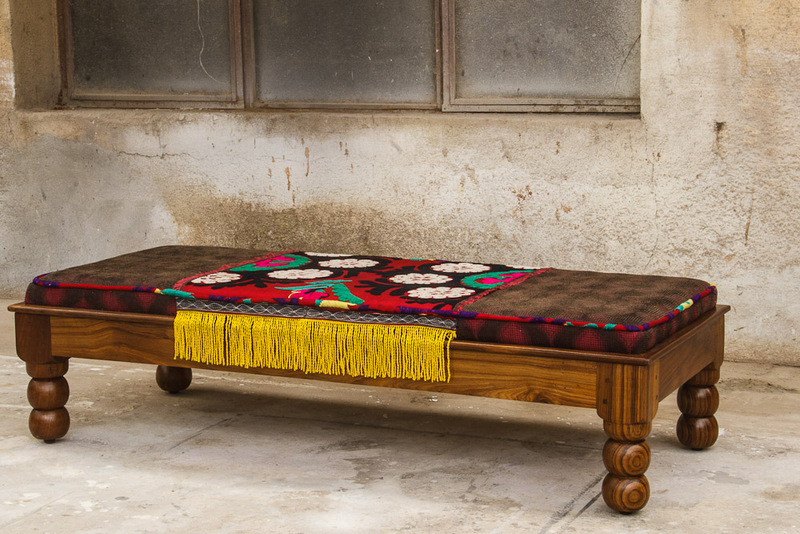 This entry was posted in Events and tagged artisans, carpets, central asia, exhibitions, ikats, jewellery, kala ghoda, kashgar, khotan, pragati toshniwal, silk route, suzanis, thangkas, tibetan carpets. Bookmark the permalink. Both comments and trackbacks are currently closed.